To be confident enough to step into territory whether it be risk free or antagonistic, takes courage. A people, enslaved, were forced to seek creative ways to maintain their equilibrium. The creativity manifested itself in a plethora of media; visual representation in painting, fabric pattern-weaving and architecture. In addition to rhythmic instrumental and vocal music, is the oral tradition of the art of story telling. A people, enslaved, were forced to seek creative ways to maintain their equilibrium. We as a people brought these gifts across the water with us and they remain an integral part of our culture. It is this cultural gift we share with you. 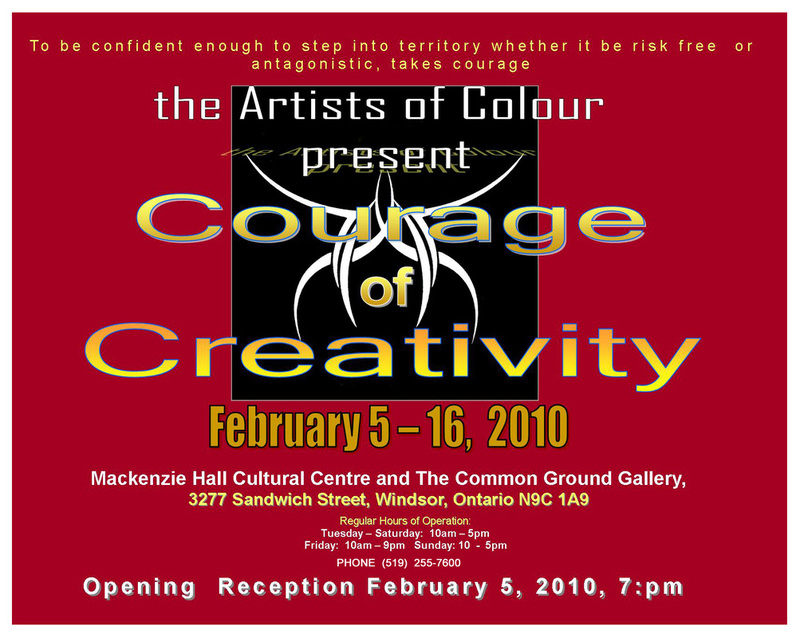 The Artists of Colour realize without courage to think outside the box and act upon it, creativity would be thwarted. Their goal continues to be the same, and that is to be a platform and catalyst to encourage creativity, cultivate excellence, and promote uniqueness.